Today I am just tweaking the piece. Using many of the colors used previously in this painting, I work around the image touching up areas. I use light washes to push areas to the background, and I used warm washes of yellows or Burnt Sienna to pull things to the foreground. 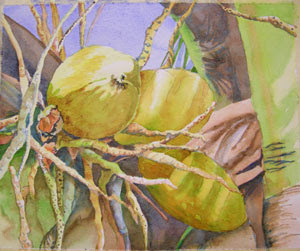 I again used Prussian Blue to work in some of the finer details, especially around the end of the top coconut. I used a number six round brush with a nice point, pulling and pushing the brush to create varied strokes. Visit back tomorrow to view the completed painting!